© AP Photo/Pablo Martinez Monsivais President Donald Trump walks to board Air Force One, Saturday, Oct. 6, 2018, at Andrew Air Force Base, Md. 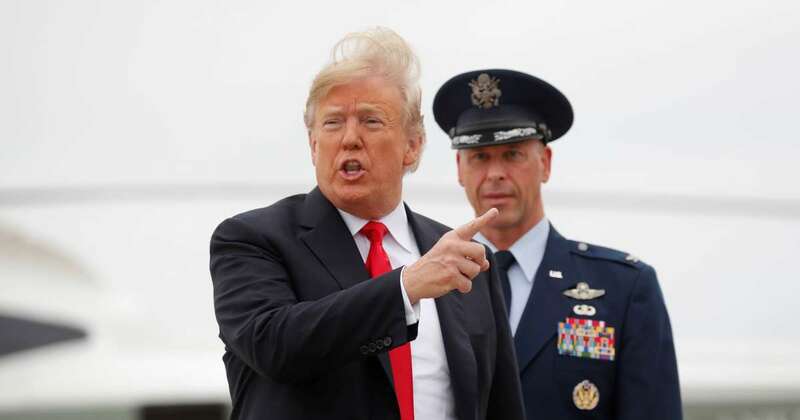 Trump is traveling to a campaign event in Topeka, Kan.
U.S. President Donald Trump said he is "100 percent" certain that Christine Blasey Ford named the wrong person when she accused Brett Kavanaugh of sexual assault in testimony during his Supreme Court nomination hearings. "We’re very honored that he was able to withstand this horrible, horrible attack by the Democrats." Trump's words echoed those of Ford who told the Senate Judiciary Committee that she was "100 percent" certain it was Kavanaugh who sexually assaulted her in the upstairs bedroom of a home in a wealthy Washington suburb in 1982 when both of them were teenagers. He disputed predictions that women voters angry about Kavanaugh's nomination could punish his party in the congressional elections on Nov. 6. Hundreds of protesters in and around the U.S. Capitol - many of whom were women - were arrested in the past week. “Women were outraged at what happened to Brett Kavanaugh, outraged,” Trump said. "It was a total misnomer because the women I feel were in many ways stronger than men in his favor."